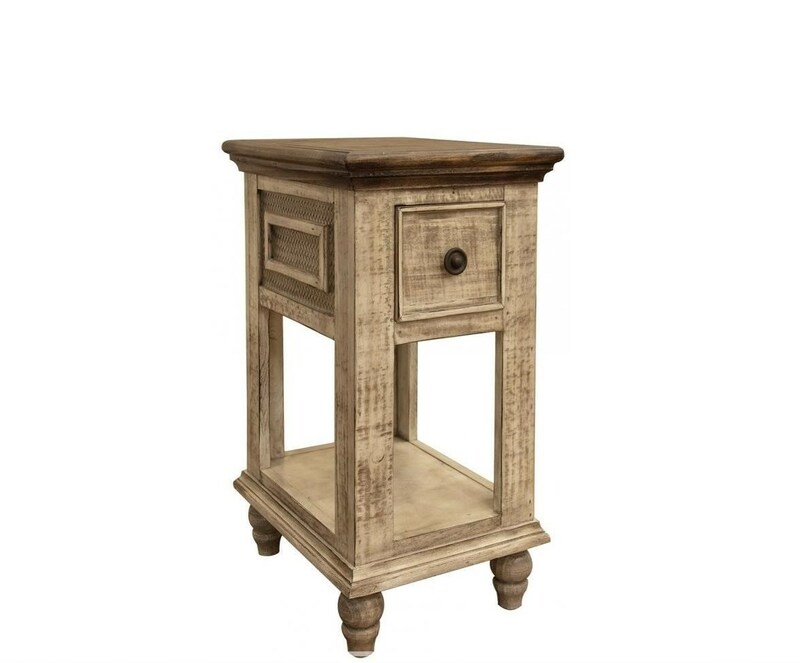 Bring rustic charm and convenient storage to your living space with this chair side table. It features a textured two-toned finish, as well as mesh patterned sides for a truly unique, tactile design. Plus, this piece is made from solid wood and has a built-in drawer and bottom shelf, so it's sure to be a functional addition to your decor as well a stylish one. The Laguna Rustic 1 Drawer Chair Side Table with Bun Feet by International Furniture Direct at Zak's Home in the Tri-Cities, Johnson City, Tennessee area. Product availability may vary. Contact us for the most current availability on this product. The Laguna collection is a great option if you are looking for Rustic furniture in the Tri-Cities, Johnson City, Tennessee area. Browse other items in the Laguna collection from Zak's Home in the Tri-Cities, Johnson City, Tennessee area.